Guests often ask the difference between “whole grain” and “sprouted grain“. The difference essentially is sprouted grains are allowed time to sprout, then they are ground and used in bread. In whole grains, the whole kernel of the grain is ground to flour. Often sprouted grain breads are labeled as “flourless” due to the fact they are not ground completely to flour. In both cases, all three layers of the kernel are left in tact. This is preferable to white flour where the germ and the bran layers are removed and just the endosperm is ground to flour. The germ and the bran layer is where all the protein, vitamins, minerals, antioxidants, healthy fats, and fiber are found. Therefore, none of the nutrition remains. For the most part, whole grain and sprouted grain are equal nutritionally. 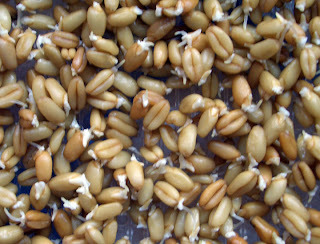 Sprouted grains may have a few advantages, but they are minor and in the long run may not be essential to worry about. Here is a great article that explains those differences. The take home message: make sure the product is a whole grain, whether it has been sprouted or not. Avoid refined flours and sugars which will do nothing for you nutritionally. Here is part two on cholesterol written by my intern. Enjoy! Part 3 with be the final installment next week. So you already know to avoid food and products with cholesterol and you may even know the importance of avoiding saturated fats (found in animal-derived foods like meat, dairy, butter and many baked goods) and trans fats (found in fried food, shortening and many commercially packaged products, such as cookies, crackers and chips) since these bad fats are the true culprit of raising LDL bad cholesterol.
. In the United States, if a food contains less than 0.5 grams of trans fat per serving, it can be labeled “trans fat-free? If there are several servings in the product 0.5 grams can add up quick, especially if its a favorite item you consume regularly. So dont rely on a claim that says trans fat-free. Rather always check the ingredient list and avoid anything that says hydrogenated oils even if the nutrition label says 0 for trans fat.
. that consuming unsaturated healthy fats is just as important as avoiding saturated fats? These fats are called monounsaturated and polyunsaturated fats and come from plant-based foods such as nuts, olive, peanut and canola oils. They have the ability to improve HDL good cholesterol. Remember you want your HDL number high, because HDL cholesterol is responsible for reducing LDL bad cholesterol and has anti-inflammatory abilities. In addition, foods containing omega-3 fatty acids such as fish, walnuts, almonds and flaxseed have the ability to improve your HDL to LDL cholesterol ratio.
. Not all fats are created equal. Rather than following a low-fat diet, make sure your diet consists of the right types of fats so you dont miss out on all the healthy benefits from unsaturated fats. What about fiber?…. So you may also be well informed that fiber helps reduce cholesterol and that you need 25-30 grams per day. But do you realize why, what kind of fiber, and where to get it? There are two types of fiber  soluble and insoluble. Insoluble fiber means that it doesnt dissolve in water and for this reason it increases stool bulk and aids in digestion. Insoluble fiber foods include whole grains, wheat bran, nuts and many vegetables. Soluble fiber however dissolves in water to form a gel-like material and is the type of fiber responsible for lowering cholesterol. It travels through the bloodstream and helps to lower LDL cholesterol. Foods that contain soluble fiber include oats, peas, beans, apples, citrus fruits, carrots, barley, flaxseed and psyllium.
. Both types of fiber are beneficial so continue to consume both but if you want to see the benefits of lower cholesterol youll have to make sure you are incorporating the right types of fiberous foods more soluble fiber rich foods. Carboyhydrates??? What do carbohydrates have to do with cholesterol?…As though you didnt already have enough to worry about, now carbohydrates too? Dont get too worried, you still get to have your carbs and eat them too. Nowadays carbohydrates get a bad rap and they are commonly thought as bad or fattening or that they will lead to weight gain. The truth is that carbohydrates are the single most important nutrient for energy and the only form of energy that your brain can use. They should make up the majority of daily caloric intake from 45-65 percent of calories depending on your goals. The problem only arises when we consume more than what our bodies can utilize. But this stands true for any nutrient. When you eat, your body converts any extra calories it doesnt need right away into triglycerides. The triglycerides are stored in your fat cells. Later, hormones release triglycerides for energy between meals. If you regularly eat more calories than you burn, you may have high triglycerides. For this reason, the infamous low carbohydrate diets have actually shown to be affective in lowering cholesterol. But dont be fooled, low carbohydrate does not mean to cut out all breads, grains, cereals and pastas and live off tuna and vegetables forever. It simply means to aim on the lower end of the daily percentage while adding lean proteins and healthy fats. Restricting carbohydrates too much can be just as detrimental as over-consuming them. This is another post written by an intern. It is a long one so we will be doing it in segments. Enjoy!
. So you get your blood work done in April and the results of your lipid panel show that your cholesterol is at 250 mg/dL. Your doctor tells you that you have high cholesterol (called hypercholesterolemia) and that your diet and lifestyle need to change in order to lower your cholesterol below 200 mg/dL and reduce your risk for heart disease. .hmmm, yeah I could probably eat a little healthier and stand to lose a few pounds. I was wondering when all those double cheeseburgers would catch up to me. Either way for the next month you religiously heed the doctors advice- you dont smoke, if you drink its only in moderation, you exercise very regularly and maybe you even lose a few pounds. You follow a low cholesterol diet cutting out red meat, eggs and whole milk. You even increase your fiber with more fruits, vegetables and whole grains, after all the cereal box advertises that you can lower your cholesterol with fiber right? One month later in May you go in for a follow-up and find that your cholesterol has lowered to 220 mg/dL and you are now considered only borderline high. Youre thrilled with your improvement and relieved to see that your hard work is paying off, but you are determined to see that number below 200 without any association of the word high and would rather try and accomplish it without medication. You set-up another appointment for July determining that at this rate, two months should be plenty of time to see some superior results. You continue your regimen, but come July your blood work shows your cholesterol is 210 mg/dL, improved but still elevated. You think to yourself what gives?
. Cholesterol not only comes from the foods that we consume but our bodies have the ability to make our own endogenous cholesterol. This explains why cholesterol is not an essential nutrient and why all cholesterol is found in only animal-derived foods. That being said, genetics can play as large a role in cholesterol levels as diet and exercise. That doesnt mean you should give up on these healthy habits and admit defeat to your genetic code, it just means that you may have to work harder than others at keeping your cholesterol levels in check, especially if hypercholesterolemia runs in your family. the list goes on and on. Research shows that even a 5-10 lb weight loss can improve cholesterol levels and even if youre not overweight exercise will raise your HDL cholesterol good cholesterol. You want your HDL number high because it has the ability to lower LDL bad cholesterol. .Even if youre a victim of your ancestors hypercholesterolemia genes, lifestyle factors can greatly affect your health for the better or worse. And if you choose to take a cholesterol lowering medication dont negate the importance and power of diet and exercise. I see it again and again; A guest who has made unbelievable improvements in her cardiovascular strength, physical strength and mental state. Her clothing even fits a bit looser than a week before. She feels better, looks better and is even more positive. But the minute she steps on that scale and sees anything less than 4 pounds lost she immediately tears up and wonders why she went through all the hassle of the past week. Its as if those other factors dont matter at all; Its as if all the other improvement that she gained in her week here mean nothing. How your clothes fit: whether its the ability to once again wear sleeveless shirts or Capri pants or a certain size of clothing. Cardiovascular Fitness: can you be active? If a friend calls and invites you to a 3K Fitness Walk benefiting Breast Cancer are you able to participate? Can you play with your kids? Doing a triathlon or running in a 10K might also be a goal but isnt necessary to be considered active. Physical Strength: Are you able to carry your own groceries? Deal with tasks that require some strength? Strength often equates to independence. Realistic goal weight: this does not mean weighing what you weighted when you were 18 or even 25. Consult with different sources to find out what your goal weight range should be. Before you step on the scale next time review the other aspects that go into your healthy-feeling goal and make sure that you are not putting too much importance on what the scale says. You just might find that you feel better about yourself and your journey towards a healthier you. I had an intern a few weeks ago that put together a great blog on phytochemicals. I hope you enjoy! So you already know the importance of eating your fruits and vegetables and all the vitamins and minerals they contain. But alongside the benefits from the vitamins and minerals they contain are natural bioactive compounds  known as phytochemicals that have protective and preventative properties against disease. Research suggests that they can help slow the aging process due to their antioxidant affects, lower blood pressure and reduce the risk for heart disease, diabetes, stroke and some cancers. The word phyto is greek for plant so these chemical compounds pertain to only plant foods. Generally, the more rich in color the fruit or vegetable is the more phytochemicals it contains. So choose a variety of vibrant colors like green, orange, red, yellow, blue and purple. There are close to 1,000 phytochemicals but listed below are some of the most commonly known. Learn which colors contain which phytochemicals and their associated benefits.